I looked at necklace, thinking I shouldn’t disappoint her, but a small section of the necklace didn’t have pearl on it. “I’ll wear it next time,” I said. “No, Mom, wear it today,” she said. She wasn’t happy; I felt terrible. Many years later, I got older and was no longer care what people think of me. 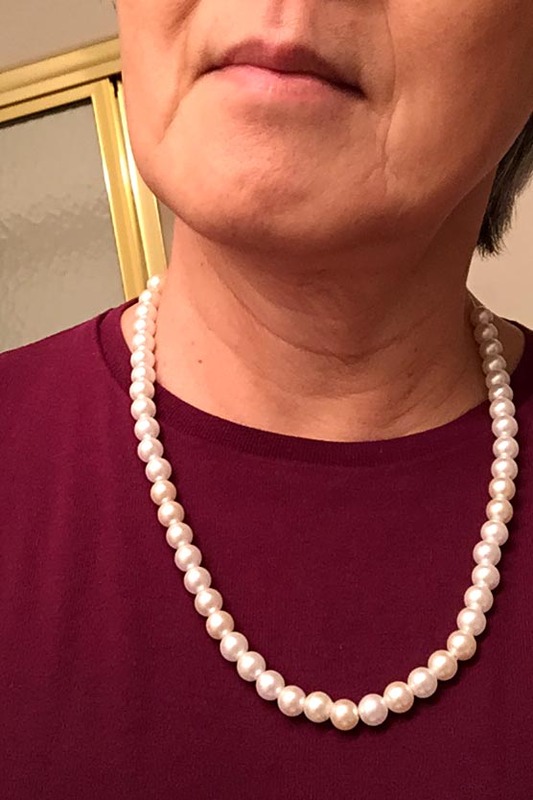 One day, when my daughter was home, I put on the pearl necklace for dinner at a nice restaurant. “Where did you get that?” my daughter asked. This entry was posted in Memoir, Writing. Bookmark the permalink. Oh, Helen–this just made me smile. So sweet….the things we do for our children. Great story ~ I remember feeling so proud when my mom wore this very thin gold chain I got her from my lawn-mowing money…kids remember the best things and there isn’t anything better than Mom 🙂 We always know that Moms give everything (and more) for us…. Love this story (and great photo too…love the necklace, is it the one?!?). That would be awesome! Please let me know when you will be back…that would be cool! Hi Helen, everything has the right time, we can’t fix it later. Have a great week! I love this story. It tells much about mother and daughter… Beautifully done, Helen! Made me laugh out loud. This is another beautiful slice of life through your eyes, Helen. What a sweet story. I think its funny how our outlook on things change. You no longer worry about what people think…now your daughter is embarrassed! A story about time. You’ve been giving us sweet and thought provoking, memorable stories. It is true. But when you wish they forget something, usually they don’t 😉 I haven’t fully figured it out yet. I was a coward about having kids, and I know it was for the best !